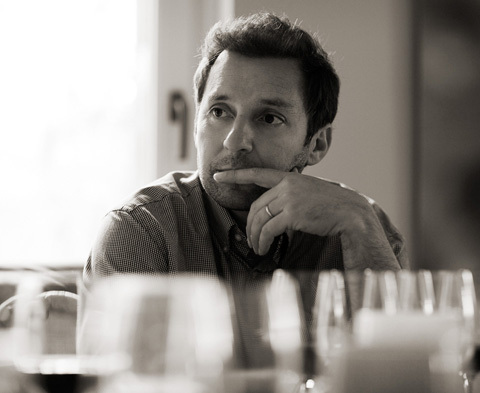 Philippe Melka was born, educated and trained in Bordeaux. He worked at some amazing Chateaux, including Petrus and Haut-Brion. In addition to working side-by-side with his friends at Parallel Wines, he crafts several more of Napa Valley's most sought-after wines. Philippe's touch is clearly evident in the wines he makes, although he believes in strictly noninterventionist winemaking, designed to let the fruit produced by a great vineyard - not the art of the winemaker - shine through. "I don't use any tricks," Despite his high-profile status, Philippe is humble about his many accomplishments. With a wonderful mix of humor and dedication, he applies his skills to every aspect of producing Parallel Wines. Philippe’s credentials are staggering, but what continues to be most impressive to us is the man himself. His blend of hard work, integrity, affability, loyalty, joie de vie, and commitment to friends and family, surpass his terrific skill in blending wines. Thank you! Parallel has carefully selected its fruit source vineyards. The foundation in any vineyard is matching the soil type to the vine. When the soil, microclimate, rootstocks, clones and farming practices are in concert the vineyard will yield the best that it can offer. At the end of the day, we are able to carefully select the barrels for blending and for achieving the best possible Cabernet wines. We have been fortunate indeed, with our vineyards providing a symphony of focused layers of different flavors in the wine. Now add the wonderful vineyard managers, our philosophy and a truly gifted winemaker. While we commonly think of terroir as the soil and the microclimate of a particular vineyard, which give the fruit its identifiable character, a consistency and sense of the place, year after year. The people just as powerfully define Terroir. Parallel is made up of its passionately involved partners, one of the world's most dedicated and skilled winemakers, and some of Napa Valley's most experienced and talented vineyard managers and farmers.